The Chicago metropolitan area has one of the nation's largest public transportation systems. Our medical campus is accessible from the #4 Cottage Grove, #2 Hyde Park Express and #55 Garfield bus routes. The CTA also provides a number of express buses to and from Hyde Park. 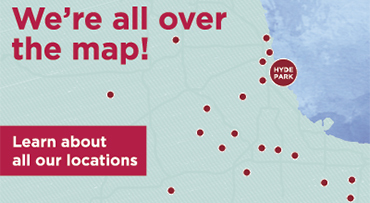 Visit the University of Chicago Transportation Services site for exact schedule and route information. Use an online trip planner to find the best route for you. Our medical campus is accessible from the north or south by the Red Line, and from the west by the Green Line. The Metra Electric District line has two stops near our campus: one at 57th Street at Lake Park Avenue, and one at 59th Street at Harper Street. The #170/University of Chicago Midway CTA bus provides service to and from these stations and the medical campus (860 E. 59th Street entrance) during weekday rush hour periods. The South Shore Line train provides service between Northwest Indiana and the 57th Street station. 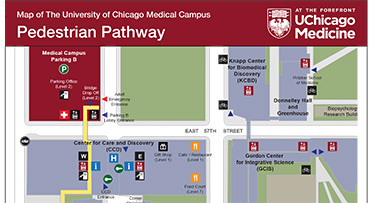 The #170/University of Chicago Midway CTA bus provides service to and from these stations and the medical campus (860 E. 59th Street entrance) during weekday rush hour periods. Weekdays CTA #192: U. Of Chicago Hospitals Express provides service from and to Union and Ogilvie train stations to our campus. In the morning, service is only from downtown to the hospital. 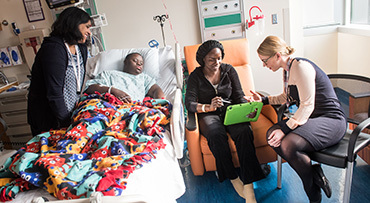 In the afternoon and evening, service is only from the hospital to downtown. This service is provided by the CTA. The fare is the standard CTA fare, and is payable on the bus in cash or with a CTA/Pace fare card.